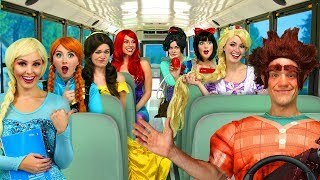 Disney Princesses Carpool Ride and Ralph is the Bus Driver! Rapunzel, Ariel, Belle, Vanellope, Elsa & Anna. We pretend play Disney Princesses in real life with Rachel Mathieu playing Rapunzel, Jenn Barlow playing Elsa, Jolyne Lowery playing Ariel, Danielle Spisso playing Snow White, Scarlet Sheppard playing Anna, Avalon Warren playing Vanellope and Adam Rodney playing Ralph.